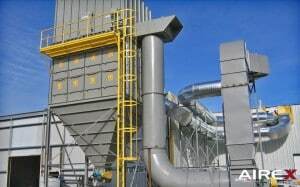 The Pulse-Jet Bag dust collector, also known as the baghouse, has been used successfully for decades for everything from rock crushing, to coal handling and production wood-working. 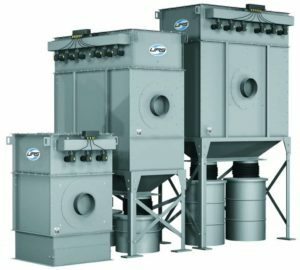 Round filter bags, from 4” to 6” in diameter and up to 12 foot in length, are suspended vertically inside the housing. Round wire cages keep the bags from collapsing as the air passes from the outside in. Cleaned air travels out of the bag’s top and into the clean air plenum, then into the fan. When cleaning, a pulse of high pressure air is directed into the bag (reverse-flow direction), inflating the bag and causing fabric deflection and high inertial forces that separate the dust from the bag. Dust drops into the hopper which is then emptied using a rotary air lock.